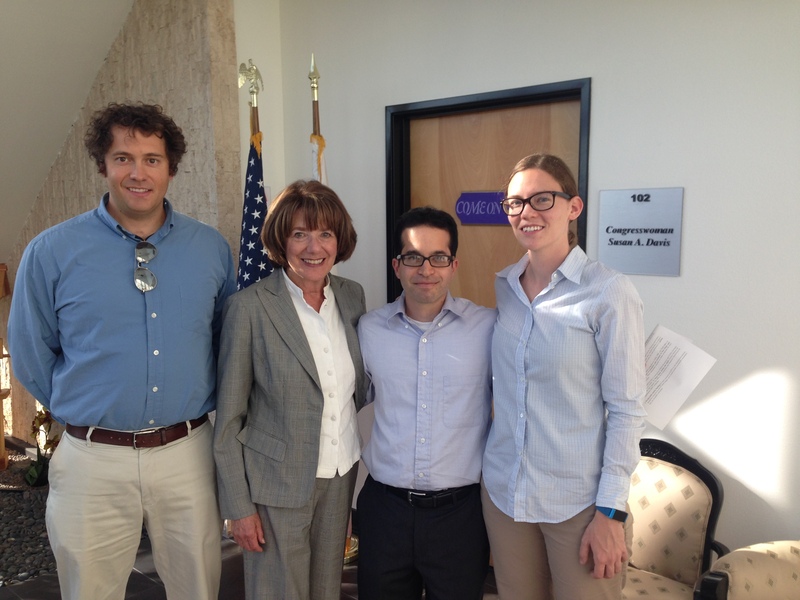 Last Tuesday, three weeks before the midterm election, three astrophysicists—graduate students and Ph.D. candidates Darcy Barron and Evan Grohs and I (a research scientist)—met with Representative Susan Davis (CA-53) and her staffer, Gavin Deeb. We had a twenty-minute meeting to talk about science in her district office in North Park, San Diego, which is on Adams Avenue and biking distance from my home. Darcy and I are her constituents, while Evan is a constituent of Rep. Scott Peters (CA-52), who is also a science advocate but is in a tight election race. I enjoyed participating in the Congressional Visit Day in Washington, DC, earlier this year (and Darcy had previously participated in the program too). In March, Josh Shiode (AAS Public Policy Fellow) and I had a short meeting with Rep. Davis and one of her DC staffers. This time in her San Diego district though, we had more time to chat. As before, she was very receptive to our message for federal investment in basic research, education and public outreach in the astronomical sciences and in science in general. The current science budget situation and constraints from the ongoing “sequestration” leaves Congress and the Executive branch with little wiggle room, but we need to make the best of a bad situation. Otherwise, the US risks dropping behind Europe, Japan, and China in astrophysics research and in educating the next generation of scientists. Most federal funding for astronomy and astrophysics comes from the National Science Foundation (NSF), NASA, and the Department of Energy (DOE) Office of Science. Rather than improving and increasing these agencies’ constrained budgets, unfortunately Congress became mired in gridlock with little time before the election, and to avoid another government shutdown, Congress members had to vote on a “continuing resolution,” which basically keeps the budget on autopilot. Unless budget negotiations become an immediate priority after the election, it seems we’ll have to wait until FY 2016 to try to improve science budgets. Rep. Davis stressed the importance of science communication, outreach, and improving diversity of the scientific workforce, and we were all in agreement about that. Communicating science to the public well helps to remind people how awesome science is and how important our investment in it is. And in our outreach efforts, the young and diverse students we reach and hope to inspire will be the people who advance science in the future. Rep. Davis was clearly interested in these issues and supportive of our and our colleagues’ work on them. A couple months ago, Senator J. Rockefeller (D-WV), chair of the Committee on Commerce, Science, and Transportation, introduced the America COMPETES Reauthorization Act of 2014. According to the Association of American Universities, the bill calls for “robust but sustainable funding increases for the [NSF] and National Institute of Standards and Technology” (NIST) and it “recognizes the past success and continuing importance of the NSF’s merit review process.” It also supports each agency’s efforts to improve education of future science, technology, engineering, and math (STEM) professionals. But as Jeffrey Mervis of Science points out, support for COMPETES wasn’t sufficiently bipartisan and hasn’t been reauthorized. On the other hand, perhaps there’s a better chance of Congress reauthorizing the Higher Education Act. The HEA is the major law that governs federal student aid, and it’s been reauthorized nine times since Pres. Johnson signed it into law in 1965. Considering that at least 70% of US university graduates are burdened with debt, this is clearly important. The HEA bill, introduced by Sen. Harkin (chair of the Health, Education, Labor and Pension Committee), would provide some relief for students by increasing state contributions to public universities (and thereby reduce tuition fees), supporting community colleges, and expanding programs that allow high school students to earn college credits. Disagreements between Democrats and Republicans remain on this bill, and we’ll have to wait and see in what form it will be passed. We didn’t get into all these details, but I just wanted to give you some context. We also briefly discussed the need for graduate education reform and for preparing graduate students for the difficult job markets they face. These issues aren’t addressed in the HEA, though that bill would benefit some grad students who would have decreased loan burdens. In any case, we’ve got to continue our work and our scientific advocacy, and after the November election, we hope that Rep. Davis, Rep. Peters (or DeMaio), and other Congressional lawmakers can get back together and negotiate a better budget for basic research, education, and public outreach in the physical and social sciences.